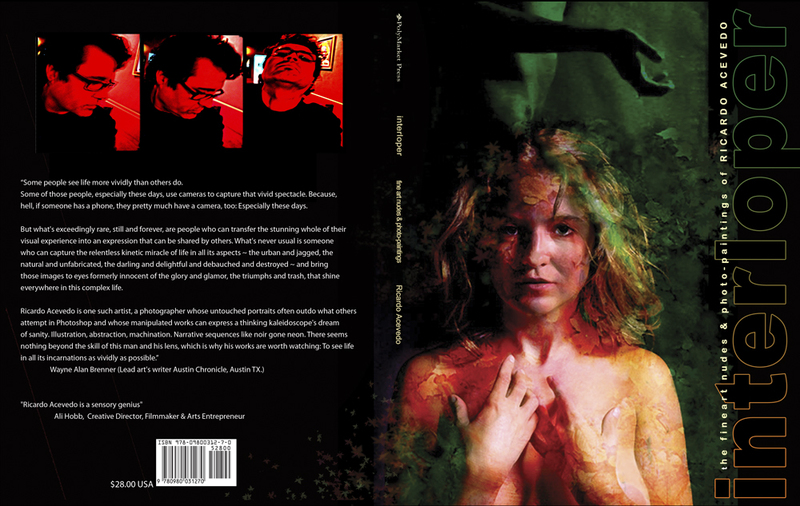 We are getting ready to do the final edits on the new book “Interloper fine art nudes and photo-paintings” by Ricardo Acevedo. Like a fine cup of espresso, its an exciting project that we’ve been brewing up this summer and is just about ready to serve; hot, rich, with deep dark color and a jolt of vibrant energy that leaves you satisfied but also ready for more. You can see the change from the original cover design to the current one–going darker, richer, more edgy, a bit more noir and mysterious–very fitting for Ricardo’s work! We’ll be updating the page for “Interloper” with information here at the PolyMarket Press site next week, and will be taking pre-orders for copies signed by the artist starting in August, with a ship date by September 1. Unsigned copies will be available after that through Amazon.com and Barnes & Noble–but you can only get the autographed versions from Ricardo himself, and through us.